Shop windows always feel a bit like wasted space. Headless manequins in static poses as if frozen in fashion future. They neither say come in nor walk by but stand more simply as pronouncements of their anotomically incorrect selves. Now, window dressers have a difficult business for sure. A few like Simon Doonan are considered minor rock (sock) stars, but most are arrangers trying to simulantiously support the brand and its message while also driving traffic through the doors of the store. That’s all to explain why I like these Nike windows. Not only do they support the idea of customization and uniqueness when everything is starting to look very safe and bland, but they actually encourage interaction. 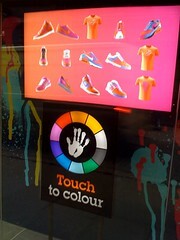 By touching the store window you can change the color combinations of the products, in effect test driving before you buy. I liked it online but I really love it as a window concept.